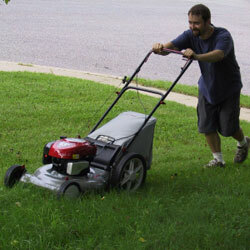 Many people do not realize the potential hazards of power equipment such as lawnmowers. Follow the manufacturer’s instructions for proper use. Make sure young children are far away from a lawnmower in use. Children less than 13 years of age should not be operating a lawnmower. Wear closed footwear and safety glasses. Remove all material such as rocks, sticks and toys from the area to be mowed, as injuries can occur from flying debris. Make sure that the lawnmower has a feature that stops the motor when the handle is released. If you are backing up, make sure to look behind you first. Make sure to refuel the lawn mower and weed eater when the motor is turned off and has cooled down.